Another agreement between Ethiopia and Eritrea signed in Jedda, Saudi Arabia on September 16 represents a new page in the shifting political alignments in this area of East Africa. Previously on July 9 a document was signed by the leaders of the Horn of Africa states in Asmara, the capital of Eritrea. This most recent agreement is designed to expand the initial understanding between Addis Ababa and Asmara leading to greater cooperation in the efforts to put an end to the state of war which has lasted for twenty years. Military conflict erupted in 1998 after a dispute over Badme on the border of the two countries resulted in the deaths of tens of thousands of soldiers and civilians in several major battles over a period of two years. In 2000 the Algiers Agreement on the Cessation of Hostilities was brokered by the-then Organization of African Unity (OAU, now the AU), the United Nations, European Union (EU) and the Algerian government. The Algiers Agreement established a Boundaries Commission and a Claims Commission aimed at working out the disagreement over Badme. Although the Ethiopia-Eritrea Boundaries Commission (EEBC) issued a ruling in 2003, the decision was rejected by the Ethiopian government. Although there was relative peace over the issue for the last decade-and-a-half, the overall situation remained tense until the diplomatic offensive which has been in the works since July. This latest accord is framed as a peace and friendship treaty which was brokered by Saudi Arabia, the United Arab Emirates, the United Nations Secretary General Antonio Guterres and the African Union Commission Chairperson Moussa Faki Mahamat. As of July it appears as if Ethiopia has relinquished its claim to Badme. “Articles five and six detail plans for the former enemies to work together in promoting regional peace and security in the Horn of Africa region. This includes combatting terrorism, human trafficking and the illegal sale of arms and drugs. With the ascendancy of Prime Minister Abiy Ahmed to power in February the new leader of the ruling Ethiopian People’s Revolutionary Democratic Front (EPRDF) has embarked upon a series of reforms which have serious implications for both domestic and foreign policy. 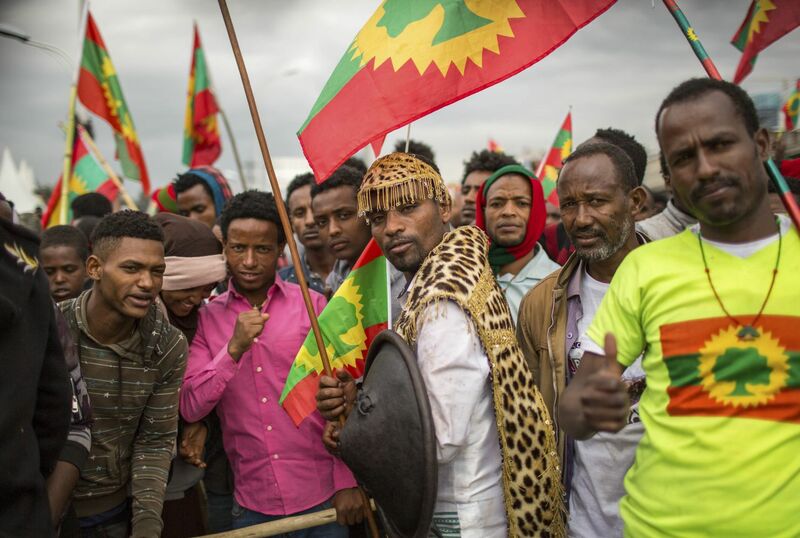 These developments have created tensions within Ethiopia prompting ethnic clashes and mass demonstrations among those opposing the Abiy program and others who support the prime minister. As it pertains to the normalization of relations between Ethiopia and Eritrea, the regional organizations throughout the continent including the African Union (AU) have welcomed the peace agreement believing that this is the best insurance against the resumption of war. Recent clashes taking place in the capital of Addis Ababa and surrounding areas were said to be sparked by the holding of demonstrations by the now unbanned and returning Oromo Liberation Front (OLF). Abiy who is from the Oromo group has been accused of not taking swift action against the violence. The unfurling of OLF flags proved to be provocative in the capital. The Oromo are the largest nationality in Ethiopia which is composed of 80 different ethnic groups. There have been 28 reported deaths in connection with unrest. Some of the killings were carried out by police in response to demonstrations and street fighting. Over 1,200 people have been arrested by the authorities for engaging in violence and other purported illegal activities. Compounding the uncertainty as it relates to the heightening of domestic tensions inside Ethiopia, there is skepticism related to the role on a foreign policy level of Saudi Arabia and the United Arab Emirates. These Arab Gulf states are heavily armed by the United States and Britain and largely serve the regional interests of imperialism. Saudi Arabia and UAE have consistently fought against what is perceived as the burgeoning influence of the Islamic Republic of Iran throughout the Middle East. Iran has been a close ally of the government of President Bashar al-Assad in Syria while Riyadh and Abu Dhabi has supported opposition forces alongside Washington and London. In Yemen the UAE and Saudi Arabia have led an intensive aerial bombing campaign and backed the ground forces of ousted President Abdrabbuh Mansur Hadi against the people of that impoverished nation since March 2015. Estimates indicate that over 60,000 people have died in Yemen as a direct result of the bombing and ground war by the Gulf Cooperation Council (GCC) as its allies. Altogether there have been approximately 100,000 airstrikes by the GCC against Yemen over the last three-and-one-half years. Many people have died from combat operations, the bombing of residential areas, schools, hospitals and government installations. Others have lost their lives to diseases and the lack of adequate infrastructure due to the targeting of essential services needed by civilians to survive. Yemen has experienced the worst cholera epidemic in the world today. Humanitarian organizations such as the World Health Organization (WHO) report that there have been one million cases of the dreaded infectious disease documented inside Yemen. Many children and adults have been affected by the outbreak leaving more than 2,000 dead and many others chronically ill. 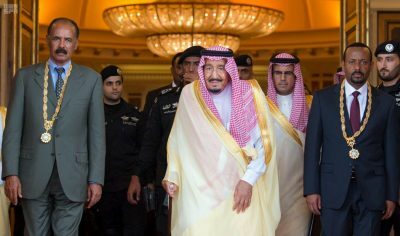 The rationale for the bombing of Yemen by Saudi Arabia, the UAE and their allies is that the Ansurallah Movement is backed by Tehran which is attempting to seize control of the strategically located country. Iran has denied its direct involvement although they politically defend the Ansurallah (also known as the Houthis) against the war of genocide being waged by the Arab Gulf monarchies. This genocidal war is being carried out with the indispensable assistance of the Pentagon through the use of U.S.-manufactured war planes, ordnances, aerial coordinates and intelligence guidance and other support. The diplomatic hostility by successive U.S. administrations towards Iran fuels the perpetuation of war in Yemen as well as Syria. One of the main objectives of Pan-Africanism is the realization and continuation of peace among African states. Without peaceful relations between AU member-states there can be no genuine development across the continent. Therefore the signing of these two peace agreements by Eritrea and Ethiopia are more than welcomed by progressive forces in Africa and throughout the Diaspora. The potential for economic and political development in the Horn of Africa is limitless due to its rich resources, productive labor force and important geo-political positioning in East Africa and proximity to the Red Sea, the Indian Ocean, the Gulf of Aden and the Arabian Peninsula. Nonetheless, the role of Saudi Arabia and the UAE in the process is bound to raise suspicions about the possible underlying aims of these states which are closely aligned with the imperialist policies of the U.S., Britain and the EU. The utilization of the Eritrean port at Assab by the UAE and Saudi Arabia for military purposes is well known. The role of these Arab Gulf states in Yemen and Syria remain inimical to the long term interests not only of the masses of people in these countries notwithstanding the need for the development of cooperation between Africa and West Asia. Genocide in Yemen and Syria fostered by imperialism mirrors the historical plight of Africa from the periods of enslavement, colonialism and modern-day neo-colonialism. Genuine Pan-Africanism is inherently anti-imperialist. Without the elimination of western hegemony and its surrogates in Africa and West Asia there can be no lasting peace in these geo-political regions so vital to the future of humanity.